I recently noticed that the icons used to upvote or flag comments are visible by default. By the way, if it's a new feature, I don't like it. It seems to be a lot of visual repetition especially when we have many upvotes. From a UX perspective this indeed feels like UI clutter. It's akin to opening a web form and all of the required fields are immediately outlined with a thick red border in an effort to let me know which fields are required. It feels like I am expected to immediately perform an action on every single comment. 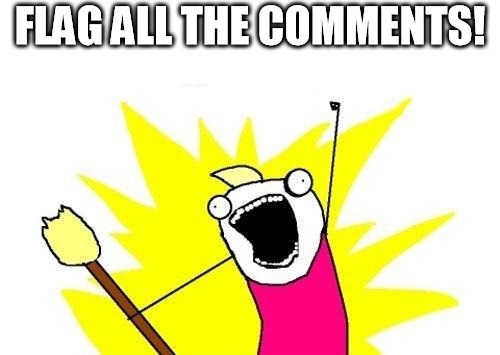 for the sake of UI consistency between posts and comments. As a bonus (not shown in my the screenshot because I was lazy) this would save vertical height for single-line comments. Reposting the answer from MSE by Monica Cellio over to here. Seems to be part of the July update and is geared towards making the UI to flag more discoverable. Since this is now status-bydesign and the reason is discoverability, I would suggest, to make it possible, to opt-out of it. If someone is changing the settings, I am sure that person already discovered that feature. Not the answer you're looking for? Browse other questions tagged support bug status-bydesign design comments . Contact us: unable to resize the message area, why?